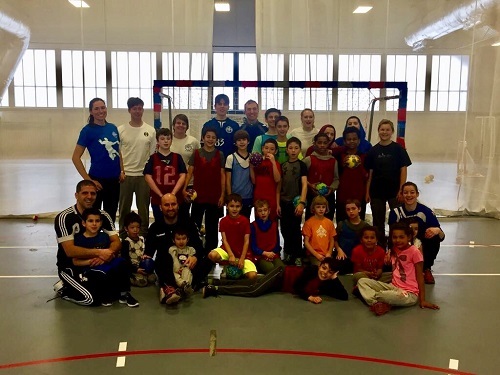 The first snow of this winter season didn't keep us from running a handball youth clinic in collaboration with German International School Boston this weekend! We had tons of fun with different dribbling obstacle courses, target shooting and a real handball game! Hopefully we can repeat this event and eventually built a team handball youth league like San Francisco CalHeat Team Handball Club for Boston! My son Connor has attended a couple of your clinics and loves playing. Please put me on your mailing list. On a side note I work in team apparel and uniforms. Please let me know if you are ever looking to do that for the youth level or if you ever need assistance with the mens or womens teams down the road. Thank you for your post. You will receive soon a invitation for our next youth clinic (Feb 24). I will keep your contact for team apparel and uniforms since we may implement that next year!